WE are standing at the edge of the Great Tide Pool at sunset on a cool and crisp autumn day. Gusts of wind rush between us leaving hair in our eyes and the breathtaking view momentarily obscured. We watch with amusement as others struggle with hair in their faces while photographing this incredible place. But the Great Tide Pool is worth it, even in the wind. The amount of diverse biological beauty hidden among the rocks between Pacific tides is almost unfathomable. A local resident from another time once noticed this too. Ed Ricketts stood near here decades ago witnessing many of the same things we see today – although thanks to sea level rise, he may have stood a little further offshore than we can. Ed Ricketts first came to Pacific Grove in 1927. He made a living collecting marine specimens along the coast then selling them to universities around the country. In so doing, he gained a deep understanding of the plants and animals that lived in tide pools and other intertidal habitats. The Great Tide Pool was one of his favorites. Ed Ricketts was not a college professor. Yet in 1939 he wrote one of the best-known scientific texts on intertidal ecology titled, Between Pacific Tides. Although Ricketts notes in the Preface that his book was intended for “the person who has had little or no biological training,” it is still used today as a valuable snapshot in time of species abundance and diversity in marine organisms inhabiting the coast at a time when no one knew much at all about climate change. Already, global atmospheric temperature has risen by 1.4° Fahrenheit (NASA, 2017). However, by 2100 temperatures are expected to rise between 2.5° to 10° F (Click Here for facts about climate change from NASA). Sea surface temperature will rise too, but more slowly. Nonetheless, we already know that even small increases in water temperature can impact marine species. Some will be unable to cope. FIGURE 1. Daily shoreline temperature at Hopkins Marine Station, 1924 – 2016. Data from HMS Marine Life Observatory. Not far from the Great Tide Pool is Hopkins Marine Station where ocean research has been underway since 1898. In 1919, the Station began monitoring shoreline water temperature. Using their data, we plotted daily sea surface temperature (data HERE) on a graph in Figure 1. The graph reveals a clear upward trend. Evidence for climate change has been around since the early part of the last century. For instance, renowned marine biologist and environmental pioneer Rachel Carson’s noted in her book, The Sea Around Us, (1951) that, “The frigid top of the world is very clearly warming up.” Climate change is not a myth or surprise. However, not everyone agrees about its cause. In 2015, a Pew Research Center survey of U.S. adults reported that 72% believed there is “solid evidence” for climate change. Of those, only 42% believed humans were responsible. However, when sorted by age more Millennials (ages 18-34) and Generation X (ages 35-50) believed human activities played a major role (47%) than Baby Boomers (41%). Interestingly, only 28% of people over the age of 65 believed humans played any role at all (PEW Research Center 2012; data available HERE). Why are young and old generations divided over the cause of climate change? One answer may lie in our early education. We, as “Millennials,” remember being educated about environmental issues at a relative early age. Even today, we see school children (Generation Z) getting involved with local organizations that actively teach about greenhouse gas pollution and the actions one can take to reduce it. We went home and discussed the generational gap with older members of our family. While everyone was very aware of climate warming, we were told they were not taught about it in school. One remarked, “We never gave the ocean much thought back then.” If generational differences during early education is a key to what divides our views, opinions, and disbeliefs later in life on climate change, perhaps there is something we could do now to try and change that. Consider this quote from Ed Ricketts’ book, Between Pacific Tides. Our solution is this: share your knowledge, no matter how big or small, of a favorite outdoor place, habitat, or environment with others. If you live near Pacific Grove, we recommend a trip to the Great Tide Pool. Pick a favorite scene. Photograph what you see. Return to this place in the coming years with new friends and family members. Take more pictures. You could even start a family tradition! In time, we expect that you will be able to look back at your photos and see the effects of climate change for yourself. Give pictures to your children so they, like us, can one day stand at the water’s edge and imagine a time when things were different — the way they used to be back in 2017. Barry JP, Baxter CH, Sagarin RD, Gilman SE. 1995. Climate-related long-term faunal changes in a California rocky intertidal community. Science 267(5198):672-675. Carson R. 1951. The Sea Around Us. Oxford University Press. New York, NY. 288 p.
NASA. 2017. Global Climate Change: Effects. (accessed November 27, 2017). Website link HERE. PEW Research Center, October 15, 2012. More Say There Is Solid Evidence of Global Warming. Pew Research Center, U.S. Politics and Policy. Online report available HERE. PEW Research Center, July 1, 2015. 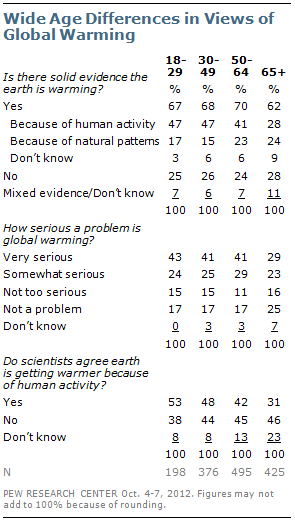 Americans, Politics and Science Issues. Online report available HERE.